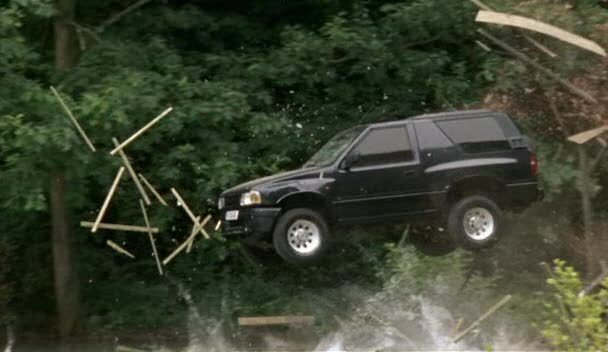 IMCDb.org: 1992 Opel Frontera Sport [UT2] in "Crash Kids: Trust No One, 2007"
Same for all Frontera? Or just the Sport version? Or just one of the generations. AFAIK, all Opel and Vauxhall Fronteras were exclusively built by IBC. All Opel/Vauxhall 4-door (UT4) and Sport 2-door (UT2) were built by IBC in the UK, with design control and engineering by Vauxhall Motors based on Izuzu platform. - Is it just a rebadged Isuzu or a vehicle that used an Isuzu basis? - Are there really [A] and [B] model? (as we have few) If yes I suppose that it corresponds to the two generations of the Isuzu listed on the link above? So both are just rebadged Isuzu? From what I remember, I believe Opel/Vauxhall Frontera [A] and [B] were basically the same model (original and facelift) and would correspond to one Izuzu model only. I don't believe there was any major retooling in the IBC/Vauxhall builds. Those were Japanese model generations, i.e. only the minimum was changed with emphasis on the sheetmetal (also common practice in off-roader cars, you rarely re-engineer the chassis). The vehicle is basically the same, except for Opel/Vauxhall engines in Luton-built models. OK so all Frontera can be labelled as origin = JP, madein = UK, madefor = EU (for Opel) / UK (for Vauxhall) ? I guess so, but I believe "made for" is unnecessary. Maybe it is useful to indicate that it is not for their originating country? Would theoretically make sense in case of Opels, but is that really so amusing that they have the steering wheel on the other side and different badges? If so, we could probably bill all non-UK made vehicles seen with RHD in the UK as UK-made (ok, not all, there are Japanese private imports and such, but you get my drift). Or does that become a little too complicated? I read that the first generation ran until 1998 and then the second generation started in 1998 (a example on this page of Opel cars: http://www.allcardetails.com/brands/opel.html .) So which is it? I'm confused. You say 1996 in your first post then you say 1998 in your second. TBH I think there are differences between model years in the 1991-98 range but I don't know these cars well enough to comment for sure. Don't worry Sandie, it is really rtsbusman who is confused (as usual) as for the question at hand, in 1998 both generations of the Frontera were sold.